Bogner left New York City for Israel in 2013 to study under Laitman at the Bnei Baruch Kabbalah Education and Research Institute, which calls itself the world’s largest group of Kabbalists. 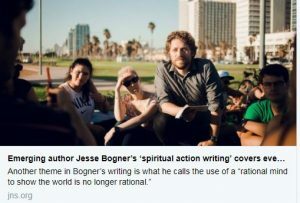 During his time at Bnei Baruch, Bogner authored The Egotist,” his spiritual memoir and social critique. His second book, Tikkunim (Corrections), published in January 2018, is a compilation of Bogner’s political commentary. He is currently writing his first novel, and his op-eds regularly appear in The Daily Caller, The Huffington Post, The Jerusalem Post and The Times of Israel. Another theme in Bogner’s writing is what he calls the use of a “rational mind to show the world is no longer rational.” His analysis for The Daily Caller on the Women’s March, for instance, argues that the activists behind the march fight to cure problems that no longer exist. Bogner is a liberal-turned-conservative whose shift occurred upon the election of U.S. President Donald Trump. Bogner cites Trump’s attitude towards trade and landmark decisions on Israel, such as moving the U.S. embassy to Jerusalem, as examples of rational policymaking. “I’ve been waiting for a politician to be rational about Israel for so long, and Trump is kind of the first leader who’s fully embraced Israel in that way,” says Bogner. Bogner says he was “the typical secular American Jew” coming from a wealthy background in New York before Kabbalah changed his life. “I would party a lot, do a lot of drugs. I was more interested in status and having a good time. I saw myself as someone who would be sort of a literary icon, even though it was largely in my own mind,” says Bogner, who graduated from Bard College with a degree in creative writing. “I got to a point where I was feeling a profound emptiness, and everything in my life that had a lot of promise seemed to be falling apart,” he adds. While Bogner was in between jobs, his father asked him if he could edit a book Laitman wrote about the Kabbalistic meaning of anti-Semitism. Later, Laitman surprised Bogner with a new proposition: move to Israel and write a book. Bogner joined the Bnei Baruch institute and started writing The Egotist, which was ultimately published by Laitman Kabbalah Publishers. Bogner’s forthcoming book, whose working title is “Gates of Impurity,” is a Kabbalah-infused novel in which the surviving Jews of the Middle East live on Shadwan, a landfill off the coast of Egypt, after being ruled by warring Islamic powers for decades.